A new family of low-power processors from Intel promises to further blur the lines between notebook and netbook--delivering power and performance similar to a full-size notebook, with the size, weight, and battery life of a netbook. IT administrators should consider this new class of mobile computers when evaluating platforms for mobile business professionals. 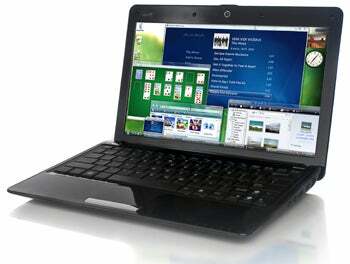 Netbooks--with their much more portable size and weight, and battery life that can last all day, have been a popular alternative to the larger, more powerful notebooks. Part of that tradeoff, though--aside from giving up built-in CD or DVD drives--has always been reduced performance and capabilities. Full-size notebooks, however, can be quite cumbersome to lug around. Chiropractors, massage therapists, and orthopedic physicians don't mind the increased business resulting from users carrying their desktop around in a bag on their shoulder, but users are in search of a middle ground that can provide the performance without the weight, and deliver the functionality without needing to be recharged every two hours. "Consumers crave laptops that offer style and performance, and the new 2010 Intel Core Ultra-Low Voltage processors for ultra-thin laptops delivers both, in one sleek design," said Mooly Eden, vice president and general manager of the PC Client Group at Intel in a press release. Eden continued "Intel's leadership in 32nm high-k metal gate process technology, combined with breakthrough architecture and design has enabled thinner, lighter and faster notebooks than previous models, with terrific battery life. Not only are laptops becoming ultraportable, but with the new processors inside, users will see faster response times and less waiting." Mobile computers built using the new Intel processors will straddle the line comfortably between notebooks and netbooks. If successful, the processors could even help redefine mobile computing and perhaps eliminate the distinction between notebooks and netbooks, leaving one category in its wake--ultraportable computers. Intel's timing is good, as the Apple iPad, and a variety of other tablet devices out now or expected to be launched sometime this year, are already aggressively at work changing the concept of mobile computing. The iPad is a distinct experience--not simply a computer shoved into a tablet form factor, and yet more than simply a mobile phone with a nine inch display. Apple's vision of mobile computing and media consumption is a threat to the dominance of the Wintel model of Microsoft Windows running on an Intel architecture. Apple may also have a superior solution for notebooks, though. The most recent line of Macbook computers use a dual graphics chip architecture rather than simply trading performance for battery life. With both a discreet graphics processor unit (GPU), as well as graphics processing capabilities built-in to the CPU, the Macbook is able to save power by using the built-in GPU for most tasks, and falling back on the superior horsepower of the discreet GPU for tasks that are more graphics-intensive. Macbooks are no threat to Wintel notebooks when it comes to price, but the new Macbook architecture does provide a compelling balance of power and battery life worth exploring if money is no object. But, if price is a factor in your decision, look for a whole slew of affordable ultraportable computers built on these new Intel processors to be available soon. If you want your mobile workforce to have the power and capabilities of a notebook, with the weight and battery life of a netbook, these could be the devices you need.